The second type of f-commerce that takes place with Facebook is Facebook-Initiated Selling, which pretty much uses one of the tabs of a business’s Facebook page as a “Store” that links to a website that completes the sales transaction. The popular opinion of folks who specialize in Facebook Marketing says that you should always keep the user within the Facebook site, as users generally hate to leave it. Through Facebook-initiated selling, the idea is that customers start on Facebook (a place where they’re comfortable), and then build trust with the brand (like in the case of Best Buy) through browsing and sharing it with their network, then they’re primed to close the deal on your site. 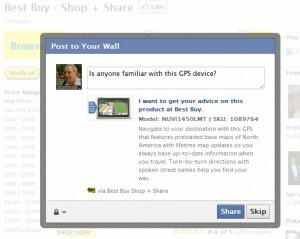 In this type of Facebook Commerce, you’re essentially using Facebook as a storefront. Had any experience with Facebook-initiated selling? Tell us about it.